My yard is being sprayed; can my kids go out and play? Pesticides on the Golf Course? When to plant after using weed killer? 2,4-D is a chlorophenoxy herbicide that is also sometimes used as a plant growth regulator. It is used in a wide variety of products in the United States. It controls broadleaf weeds by affecting the growth of the plants' vascular tissue. 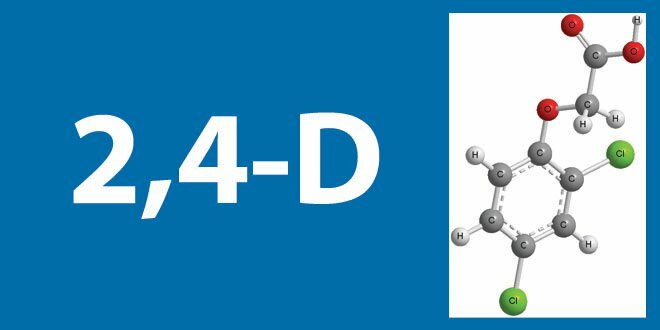 2,4-D has a number of chemical forms, including esters and salts. The different chemical forms of 2,4-D affect organisms in different ways. What are some products that contain 2,4-D? What are some signs and symptoms from a brief exposure to 2,4-D? What happens to 2,4-D when it enter the body? Is 2,4-D likely to contribute to the development of cancer? Has anyone studied non-cancer effects from long-term exposure to 2,4-D? Are children more sensitive to 2,4-D than adults? What happens to 2,4-D in the environment? Can 2,4-D affect birds, fish, and other wildlife? Would I hurt the fish by weeding and feeding the lawn? Will this weed killer hurt my grass?